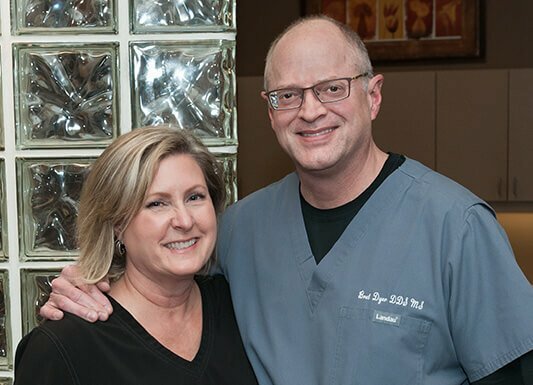 At Fort Bend Periodontics and Implantology, Dr. Bret Dyer and our talented team are driven by a desire to give you the healthy and beautiful smile you want. To do so, we focus on helping you achieve teeth and gums that function at their peak. From replacing missing teeth using dental implants to improving your smile with cosmetic treatments like gum recession repair, we provide top-notch modern dentistry that will leave you looking great. Of course, it’s also vital that you feel great, which is why we offer treatments that dramatically reduce headaches caused by TMJ. As your Sugar Land dentist, we promise to treat you like more than just a set of teeth. We tailor the care of each of our patients to address their unique needs. Feel free to ask us any questions you might have, as this guides us in continuing to learn how to serve you best. We’re honored to continue providing solutions towards the long-term dental health of our patients. We look forward to helping you achieve the look and feel of a great smile. Complete gum care, including cosmetic gum surgery. Reclaim your smile with our complete dental implant services. Innovative gum treatments for advanced recession repair. As a global leader in the fields of periodontics and implantology, Dr. Bret Dyer is known for providing periodontal treatments and dental implants to the community. He developed the laser PERIO protocol used around the world and helped develop anatomic implant components. Thanks to Dr. Dyer’s contributions to the field of cosmetic dentistry, your dental implants now look even more like your natural teeth! He also provides surgical techniques that are minimally invasive, leaving you with a faster recovery time. Dr. Dyer looks forward to meeting you and helping you improve your smile.